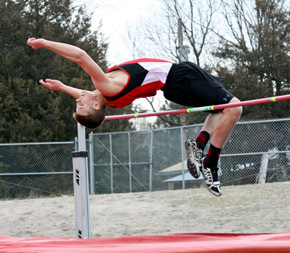 Boone Central/Newman Grove hosted three additional track & field teams in the annual Mansfield Invitational Thursday, March 28, in Albion. After missing the scheduled season-opener (Madison Relays) due to a weather postponement, it was a chance for the Cardinals to taste competition on a reasonably nice day of a cold, dreary spring. “We have not been blessed with the best of weather for our preseason practices, but the day of the Mansfield meet was pretty much the best day of the season so far,” said Cardinal Coach Kris Pestel. “All of our kids competed in multiple events. We had some nice surprises, but we also know it is early in the season and we have a great deal to work on to improve. “The competition we face in the next three meets will be some of the best in the state, so we have to continue to get better. Boone Central/Newman Grove had several athletes record multiple victories in the Mansfield Invite, which did not have team scoring. Senior Blake Slizoski, a three-time state meet qualifier, sprinted to a sweep in the 100 (11.5) and 200 (24.1) meter dashes and won the long jump (20’2¼). Boone Central sophomore Catherine Weeder won the girls triple jump (30’7) and the 800 meter run (2:31.7) and Card freshman Hannah Schmitz took first in the1600 (5:59.5) and 3200 (13:19.7) meter runs. 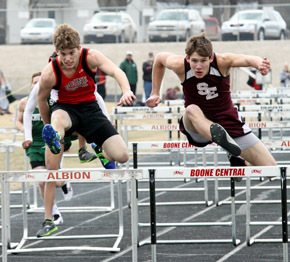 Other event winners for Boone Central/Newman Grove were sophomore Dana Pelster (100 meter dash, 13.1), freshman Sheldon Beierman (100 meter hurdles, 17.2), sophomore Olivia Slizoski (300 meter hurdles, 50.1), junior Derek Gentrup (high jump, 5’8), senior Nick Paulson (110 meter high hurdles, 17.0), senior Logan Olson (400 meter dash, 54.2), junior Matt Brugger (800 meter run, 2:13.4) and freshman Damian Backus (triple jump, 38’2).